Our house has some majorly overgrown landscaping. We have a fenced in area in our backyard that at one time must have been beautiful with a deck, fish pond and rose bushes. It was apparent the elderly lady that lived here before we moved in couldn’t take care of it. The fish pond was caved in and the landscaping was a tangle of overgrown vines. Slowly, we are clearing out the jungle. Today’s project is hauling away the stones around the pond by the wheel-barrow full. Not sure what we are going to do with them though. What do people do with a mountain of landscaping rocks. Hopefully we will be able to get the area cleared out by the end of summer. The plan is to plant the area to grass for the kids to play, it’s more practical for us. And as beautiful as the landscaping was, I don’t have the time or desire to take care of it. 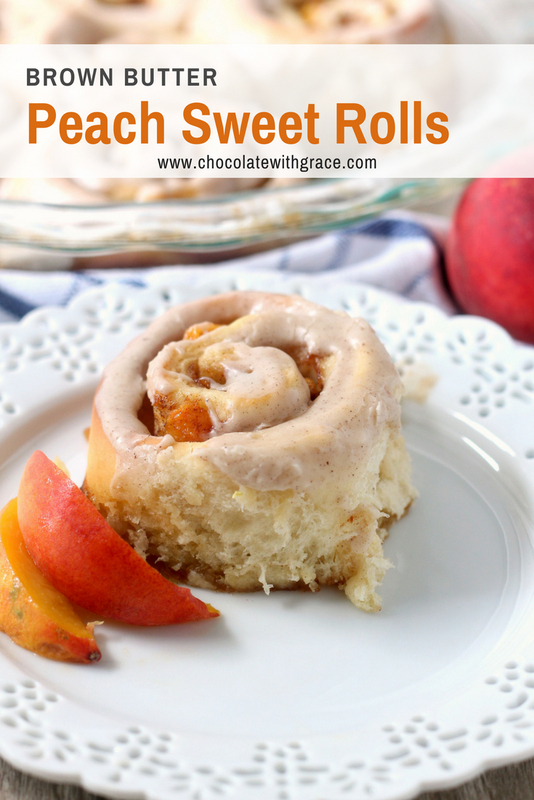 My love of sweet rolls continues with these Brown Butter Peach Sweet Rolls. I already have (raspberry cream cheese, pumpkin, s’mores, classic cinnamon, pepperoni pizza, and caramel pecan sticky buns). You guys must love them too, because they are some of the most popular recipes on my site. 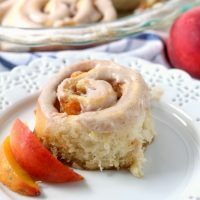 I love the pairing of brown butter and peach (check out the cupcake version and milkshake version) and I knew I wanted to make sweet rolls for awhile. My first attempt this week was delicious, but I left them in the oven too long and the browned too much so they weren’t pretty enough for pictures. So I made them a second time with a few tweaks and they were amazing. 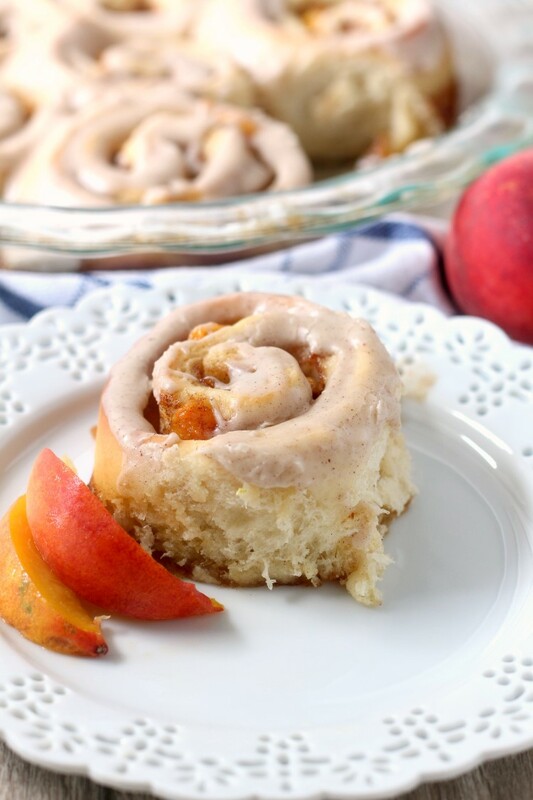 Are there any other flavors of sweet rolls you would like to see on the blog? I have one more flavor planned for this summer. Prepare the dough as directed in the basic sweet yeast dough recipe. While raising, brown the butter and let cool. Stir together the brown sugar and cinnamon in a small bowl. Mix a few tablespoons of the brown sugar mixture into the finely diced peaches. Set aside. Split the dough in half and roll each half into a 15 by 12 inch rectangle. Spread 4 tablespoons of browned butter onto each half of the dough, leave a 1 inch strip clear on one of the long ends. 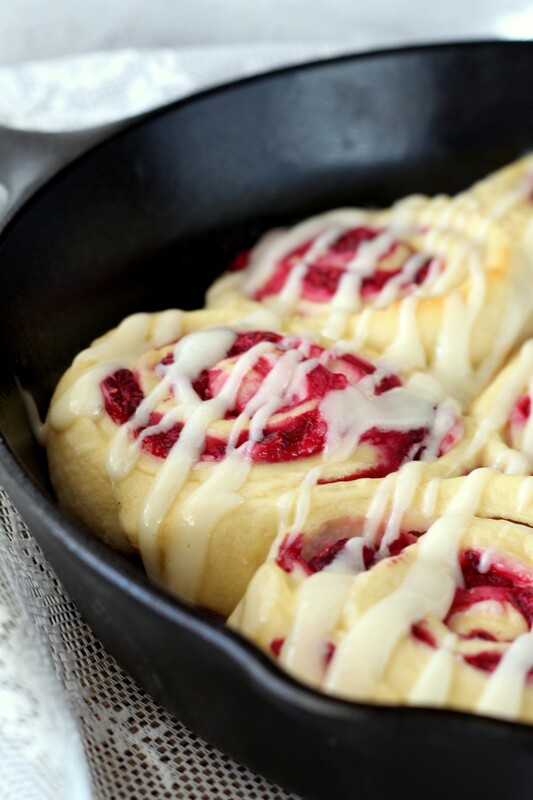 (reserve the last 2 tablespoons of butter for the glaze). Sprinkle with the brown sugar and cinnamon mixture. 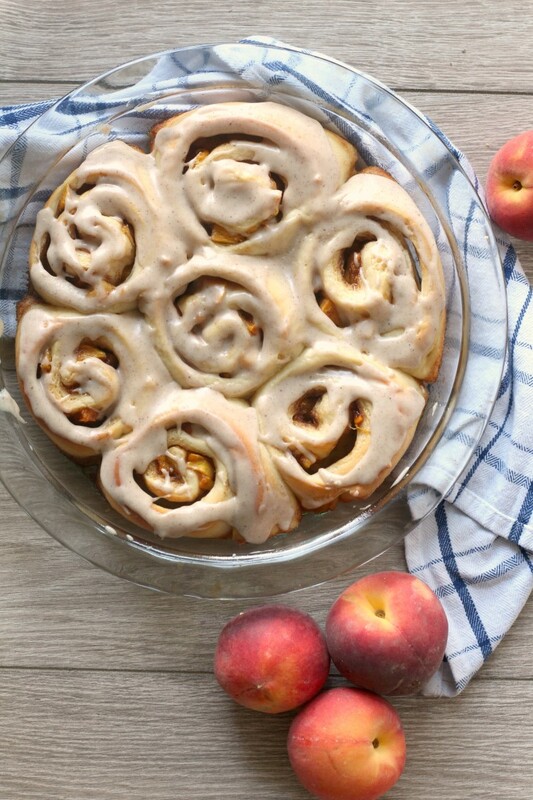 Spread the diced peaches on the dough, leaving behind any excess juices. Roll up tightly from one of the long edges. Place 3/4 inch apart in a greased pan. Cover and let rise until double. Preheat oven to 375 F. Bake for 15-18 minutes or until lightly browned. Remove from the oven and let cool slightly. To make the glaze. 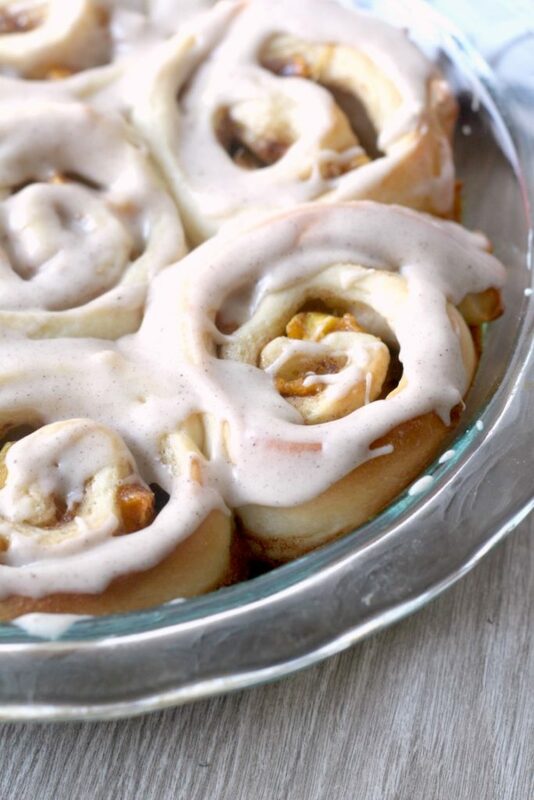 Stir the melted butter and enough warm milk to make a smooth glaze. Spread over slightly warm rolls. They are best enjoyed warm. 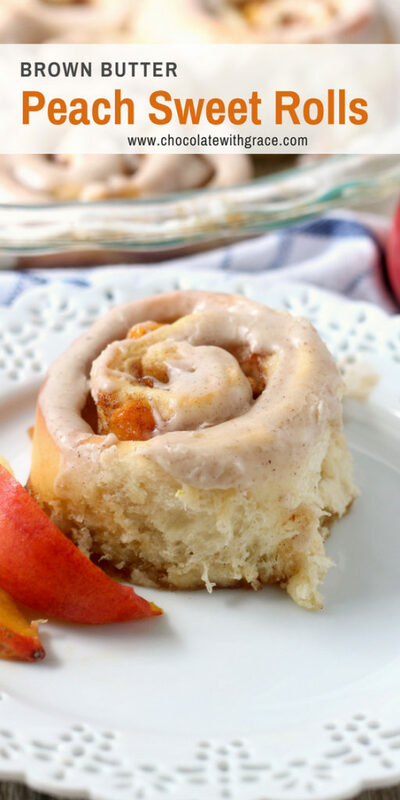 Here are some other flavors of sweet rolls that look fun to try. 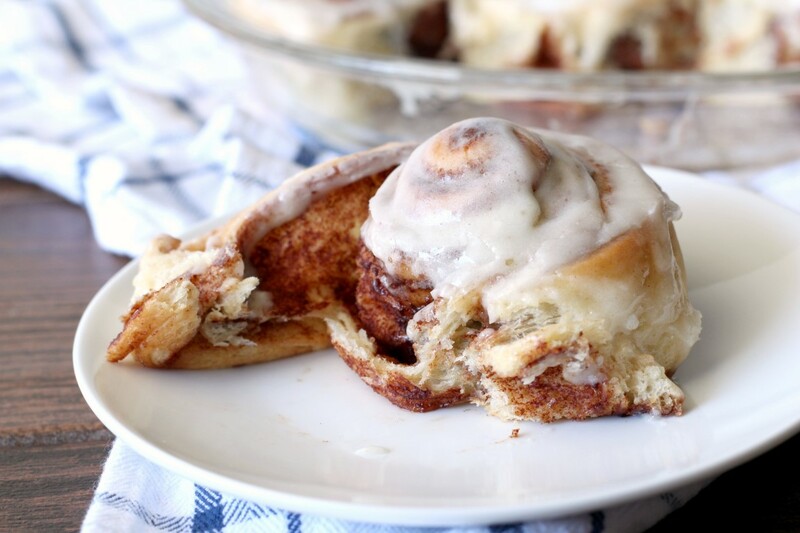 Or the best cinnamon rolls ever!